Belgrade – “A deal is a destination! Today’s signature of the Roaming Free Agreement is a step that makes a difference in the region. Amid all scepticism let us say loudly: Europe delivers”, said Majlinda Bregu, Secretary General of the Regional Cooperation Council (RCC) upon signing of the new Regional RoamingAgreement (RRA) at the second WB Digital Summit in Belgrade today. 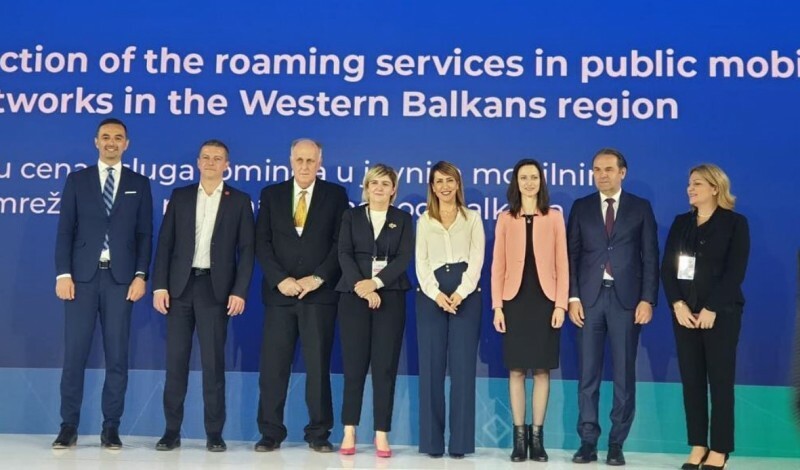 Ministers in charge of digital agenda of the Western Balkans signed the Agreement that envisages roaming-free region across the WB in 2021, also paving the way for further reductions of the roaming costs between the WB economies and the European Union (EU). “Congratulations to us all, as this agreement marks a new era for the entire region. Western Balkans has shown that together, it can and will deliver, by regional cooperation, decisive and concrete results, a tangible benefit for our citizens. The successful implementation of this agreement does not stand only at further reduction of roaming charges up to zero costs of roaming (2021) for the WB region, setting as well the process of reduction of roaming prices between the Western Balkans and the European Union, but it stands in treating citizens of this region fairly and equally. From an economic perspective, it means a huge deal for the region – it connects businesses-to-businesses faster and cheaper, it attracts tourists. It reinforces the message that Europe delivers! By putting signatures to the RRA the Governments of the region sent a clear message of their commitment to the European values and readiness to introduce them on their way towards European integration. In the first phase of implementation of the RRA the costs of the data transfer, as well as calls and SMS will be further reduced by 25 to 30%, whilst with RoamLike@Home system (RLAH) elimination of roaming charges will be ensured from July 2021 in the whole region. It took EU 10 years to make this, yet Western Balkans did it in 3, with assistance and support of the EU. Based on EU practice, RLAH will significantly stimulate the demand for roaming services and the development of the international roaming market within WB. Ms Bregu opened the WB Digital Summit in Belgrade together with Serbian Prime Minister, Ana Brnabić, and European Commissioner in charge of Digital Economy and Society, Mariya Gabriel. The RCC Secretary General also moderated the Ministerial panel that took place upon the opening of the Digital Summit, involving Tatjana Matić State Secretary Ministry of Trade, Tourism and Telecommunications, Serbia; Valdrin Lluka, Minister of Economic Development, Kosovo*,Dragica Sekulić, Minister of Economy, Montenegro; Damjan Manchevski, Minister for Information Society and Administration, Republic of North Macedonia; Dorina Çinari, Deputy Minister of Infrastructure and Energy, Albania; and Saša Dalipagić, Deputy Minister of Communications and Transport, Bosnia and Herzegovina. The participants reiterated the need and readiness for strengthening regional cooperation in the digital transformation of the WB, highlighting recent key digital achievements, identified priorities for the next year but also expressed the willingness to use available opportunities for common activities and exchange of experiences. The second WB Digital Summit taking place in Belgrade, Serbia, is bringing together participants from governments, international institutions, businesses, community organisations, academia as well as individuals from the region and Europe, to discuss and propose innovative policy approaches, showcase cutting-edge technologies, exchange ideas and discover latest digital trends and take WB digital cooperation to the next level. The Summit, hosted by the Serbian government and organized through a collaboration of the Office of PrimeMinister Ana Brnabić, Office for IT and eGovernment, General Secretariat, Ministry of Trade, Tourism, and Telecommunications and Chamber of Commerce and industry of Serbia, is co-organized by the RCC. Western Balkans Digital Summits are agreed deliverable in the area of digitalisation of the WB Multi-annual Action Plan for the Regional Economic Area (MAP REA), showing a strong commitment of the region, at its highest political level, toward the digital transformation. The first in the series of WB Digital Summits was held in Skopje last year, Belgrade hosts its second edition, and the third will be held in Tirana. The new Regional Roaming Agreement (RRA) is part of the deliverables in the area of Digital Integration for the WB Prime Ministers Summit in Poznan as part of Berlin Process, deriving from the WB Multi-annualAction Plan for the Regional Economic Area (MAP REA) that the region’s leaders committed to at the WB Summit in Trieste in July 2017 and put it as the priority agenda endorsed at the 2018 EU-Western Balkans Summit in Sofia. The Governments of the WB, with the RCC as a facilitator, and European Commission assisting in the process, have worked hard on the development of the new RRA including all WB economies.